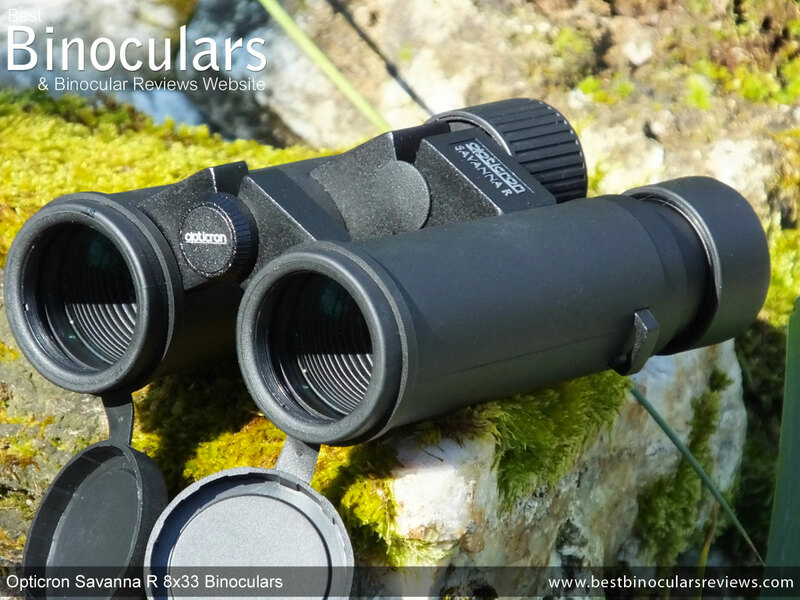 The open bridge body shape looks to me to have many of the same features and design elements as the more expensive ranges within the Opticron stable like their Natura and Verano binoculars. 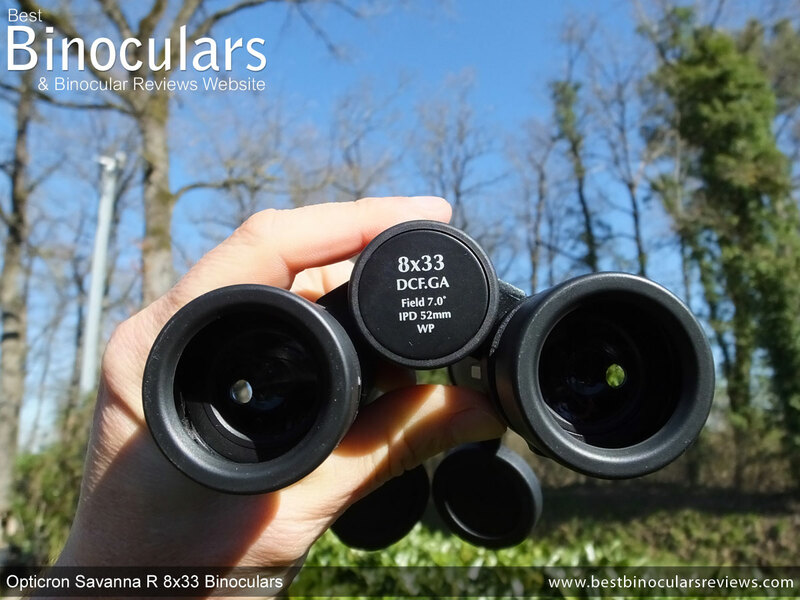 For example, take a look at my review of the excellent and high end Opticron Verano BGA HD 8x42 binoculars and you will see what I mean as to how similar they both look. This is for me great news as not only is this particular design very classy looking in my opinion, but is functional as well: This type of cut away body can help keep weight down, but more importantly the central section is a great place for you to get a secure grip onto the instrument and is a great place to hold onto them. Even with a neck strap this can be important. For example if you are climbing over large boulders and rocks or through thick bushes, having a secure grip on your bins so that they do not swing about is important in ensuring that they don't get damaged. 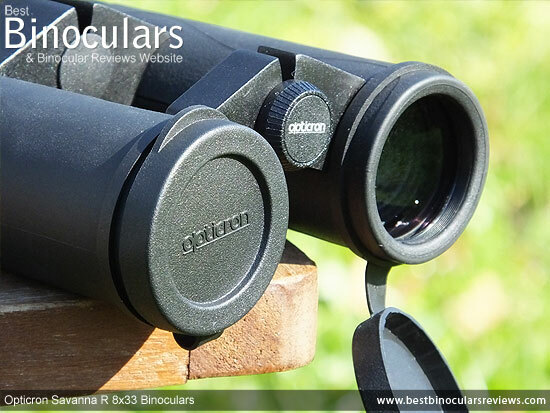 Whilst it is not publicized in their marketing materials, Opticron have informed me that the chassis is made from a combination of Polycarbonate plastic and Aluminium. We can see that the hinges themselves are most certainly metallic (I thus assume it is aluminium), which look and feel to me to be extremely robust. 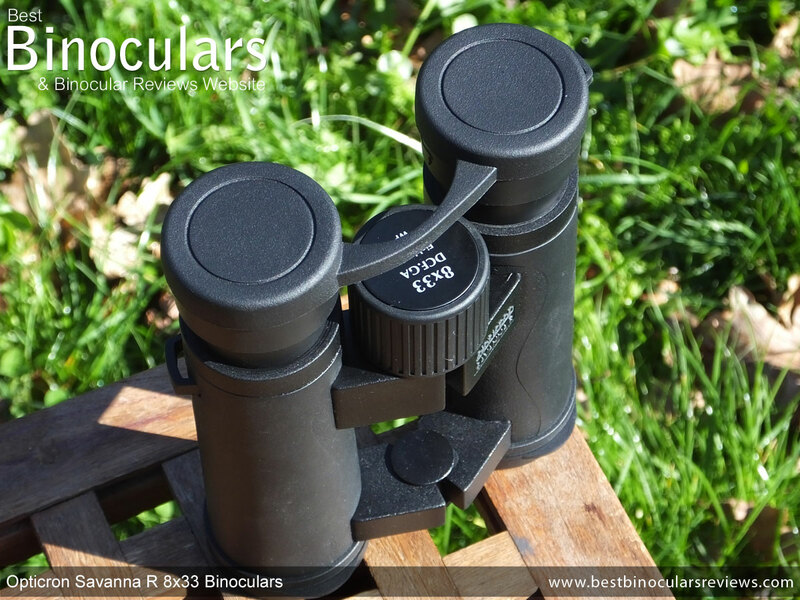 This point is particularly important as it helps to ensure that the two barrels do not go out of alignment, which is something that can happen, especially amongst cheaper binoculars where the hinge or hinges are poorly made from inferior materials. This is absolutely not the case here, indeed this is one part which looks to me to be exactly the same as that which they use on their more expensive models. The barrels have a thin and extremely hard black rubber coating added to them. These qualities mean that whilst it looks great, it most certainly does not provide as much grip or impact protection as on those instruments that have a thicker and softer rubber armour. However on the positive side, these same qualities also mean that this coating is much harder wearing, longer lasting and far less likely to perish than the thick soft rubber armors used. Whilst almost all full sized bins these days are adaptable so that they can easily accept a tripod adapter by removing the centrally located dust cap (see image above), it is not a given that all mid-sized bins will be as the smaller body size sometimes makes this not possible. For example Opticron's higher specification mid sized offering, the Discovery WP PC 8x32 cannot be adapted in this way. So it is nice to see that they have managed to keep this functionality on the Savanna R, which for some users is an important feature. 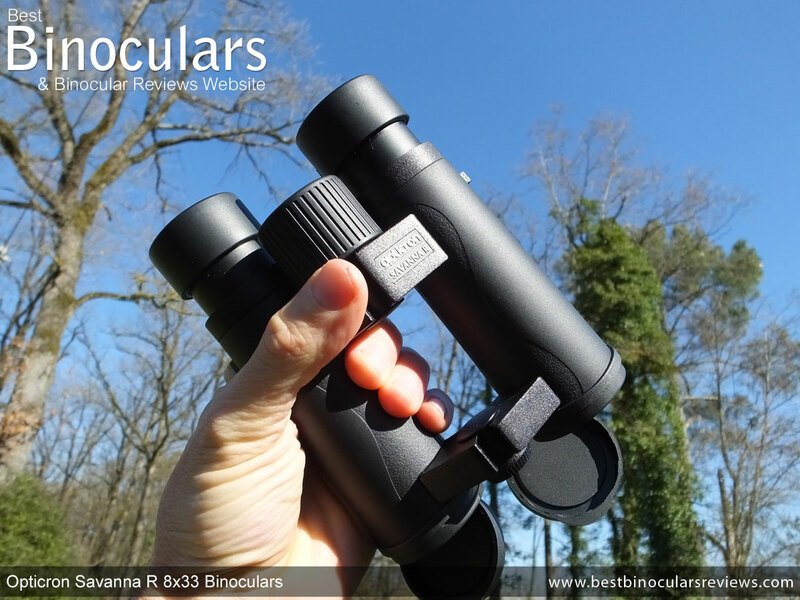 It is nice to see that Opticron have not been tempted to reduce production costs on this cheap binocular by using simple rubber fold up/down eye-cups that you can find within this price range. Instead these look to have the same twist up/down cups that you find on their more expensive models. What is more they have the same very smooth action and there was zero unwanted free movement or play on the test model that I was using which is once again excellent. Add this to the really long 20mm of eye-relief and two intermediate click stops that provide plenty of room for personalization, then you potentially have a great option for those who were glasses when binning. Indeed I tested them when wearing my sunglasses and by fully twisting down the cups, there was more than enough space for me to still get the full width of view. As with almost all bins, adjusting the distance between the two eye-cups to match that of your eyes simply involves opening or closing the central hinges. 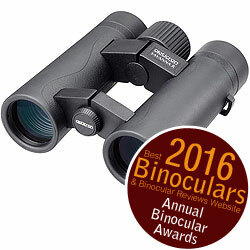 These 8x33 Opticron Savanna binoculars have an IPD range of 5.2cm up to 7.6cm, which is good and means they should be able to accommodate the vast majority of adult users and even most older children. For more take a quick look at the BBR guide to Inter-Pupillary Distance. With it's plastic face plate, it is not as refined or elegant as some, but the action is nice and smooth and it's large size (as big as those on a full sized bin) means it is easy to reach and accurately adjust even whilst wearing gloves. Taking a full 1¾ turns (630°) to adjust the focus from the maximums of near to far, it takes a little longer to make large adjustments than those that have more aggressive gearing, but on the up-side, it in theory makes the fine adjustments easier to do more accurately. 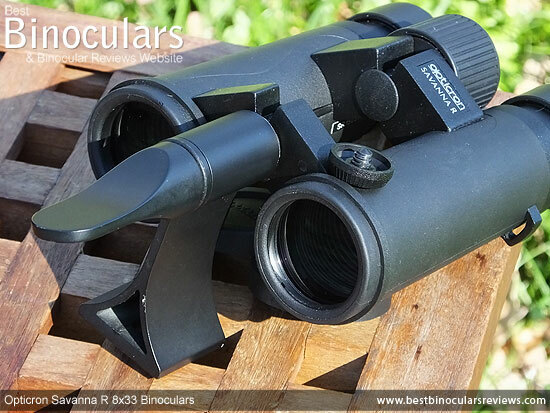 To calibrate these binoculars to allow for any differences in the vision between your two eyes, you used the diopter adjustment ring, which like almost all bins, is located just under the right eye-piece on the Opticron Savanna 8x33 binoculars. As this adjustment does not have to be made very often, the best ones are lockable to prevent accidental movement. These are not, but my sample had enough friction to make accidentally moving them less likely. What you can clearly see from the table below that compares the weights and sizes of a number of other mid-sized bins that I have tested, these Opticron Savanna R 8x33 binoculars are amongst the most lightweight. Note: I often find that more expensive bins often tend to be a little heavier as they use more metallic parts than all the plastic found on cheaper instruments. I think Opticron have settled on a nice compromise with these bins, using plastic in the right places to keep the costs down, but also ensuring that where strength is needed they have used metal. 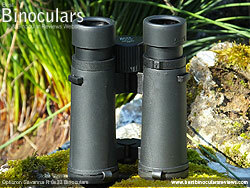 As you can also clearly see in the table above, these have fairly typical dimensions for a bin with objectives of around 32/33mm and which makes them more portable than your average 42mm binocular without loosing out too much in terms of their optical performance and low light capabilities. 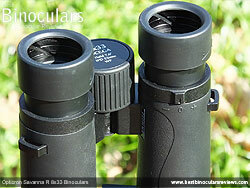 As no details are given, I cannot comment as to the exact make-up of the compound objective or ocular lenses other than to say I measured the oculars to have a diameter of 22mm which is larger than what I most commonly find on a mid sized bin and equal to those found on most full sized instruments. The 33mm objectives are also a little larger than the commonly used 32mm at this body size. The advantage of this is that they have the potential to collect more light and deliver a fractionally larger exit pupil (see the optical stats section below for more details on this). These Opticron Savanna's have roof prisms that are fashioned from BaK-4 glass which is good as you will sometimes see the cheaper BK-7 glass prisms in this price range, which are generally not considered to be as good for the use in binoculars. These Opticron Savanna R binoculars are fully multi-coated which is what we want to see as it means that every glass surface through the optical system has multiple coatings of anti-reflection material added to them. This results in a visually better quality and brighter image than many in this class that only come with single or multiple coatings on some of the glass surfaces. Unfortunately the roof prisms have not been phase corrected, which does help deliver a higher image definition. This is a shame, but not something that is often found at this price level anyway. Likewise the material used for the mirror coating on the prism is Aluminium. This has a far higher level of reflectivity than not using anything, but does fall a little short of the silver and dielectric coatings that you find on higher specification optics and results in a lower transmission level and thus potentially a less vivid/bright image. 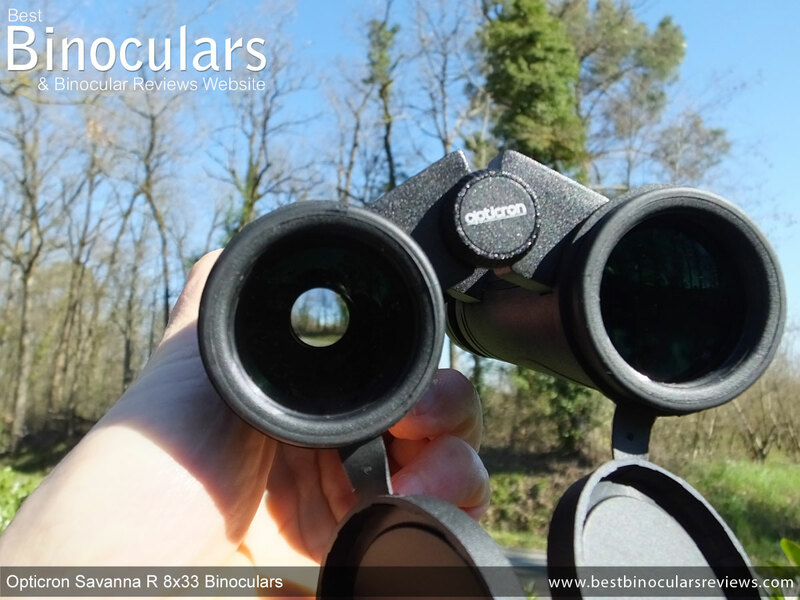 The whole idea of a mid sized binocular is to reduce the size and weight when compared to a standard (full sized) binocular, but without reducing their image quality or low light potential too much. A good way to demonstrate this is when you compare the 5.25mm exit pupil on a 8x42mm bin (42÷8) with the 4.125mm one on these (33÷8). This shows that whilst it is a little smaller, it is still large enough to deliver enough light to your eyes in all but the darkest conditions when your pupils dilate to sizes larger than the exit pupil. 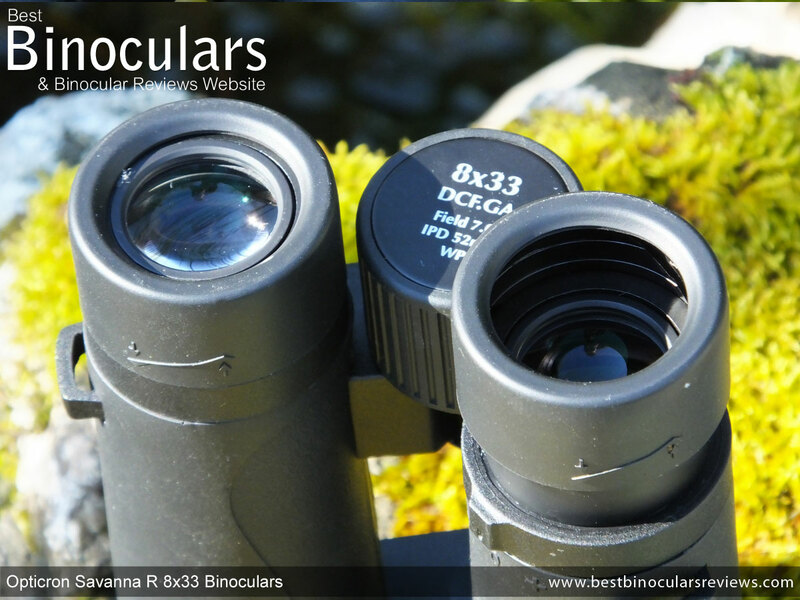 Interestingly most mid sized bins will use 32mm lenses which when combined with an 8x magnification produce a slightly smaller 4mm exit pupil (32÷8) and so these 33mm Opticron's have in theory a very slight edge in the low light department. 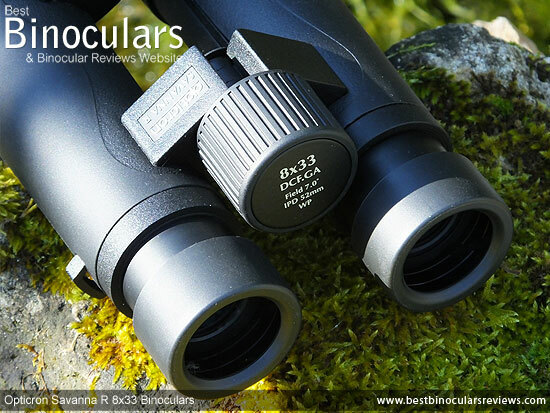 The width of the view through these Opticron Savanna R 8x33 binoculars is described as being 366 feet wide when measured at a distance of 1000 yards away (122m meters @ 1000meters). With a close focus of 11.5ft, these fall quite a long way short of the best in terms of the closest distance away that you can focus on an object. For this reason I would not suggest this as an option should you want to use them for butterfly observation for example. 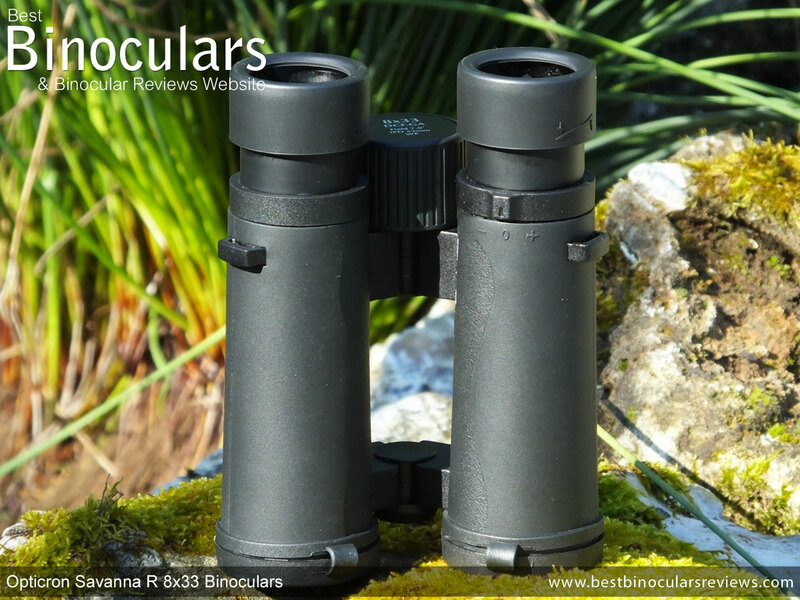 The 20mm of eye-relief is excellent and they easily make it onto my list of binoculars with long eye-relief making them an ideal choice of eye-glass users. Describing and comparing the image is always the hardest section of my reviews, yet it is also unquestionably the most important! To help me I have a number of control bins that I use for all my reviews and it is against these that I judge the instrument under test. The brightness of the image appeared to me to be equal between these Opticron's and that of my mid to high range 32mm control binoculars in good light conditions and it was only when the light was very bad (at sunset) that I became aware that my control bins were ever so slightly brighter. Considering the price and thus the different level of optics between the two, this very small difference is actually pretty impressive and I would say that within their class these do very well in tis area. The contrast and color reproduction looked normal to me and I did not observe any tinting of the image, which is something that you sometimes notice on lower cost bins like this that use cheaper glass and coatings. Sometimes referred to as purple fringing, color fringing is caused by chromatic aberrations and is viewed as the tiny coloured (often purple) edges around objects, especially in highly contrasting situations. 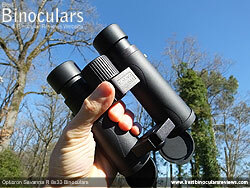 A certain amount is visible in just about every binocular that I have ever tested if you look hard enough. 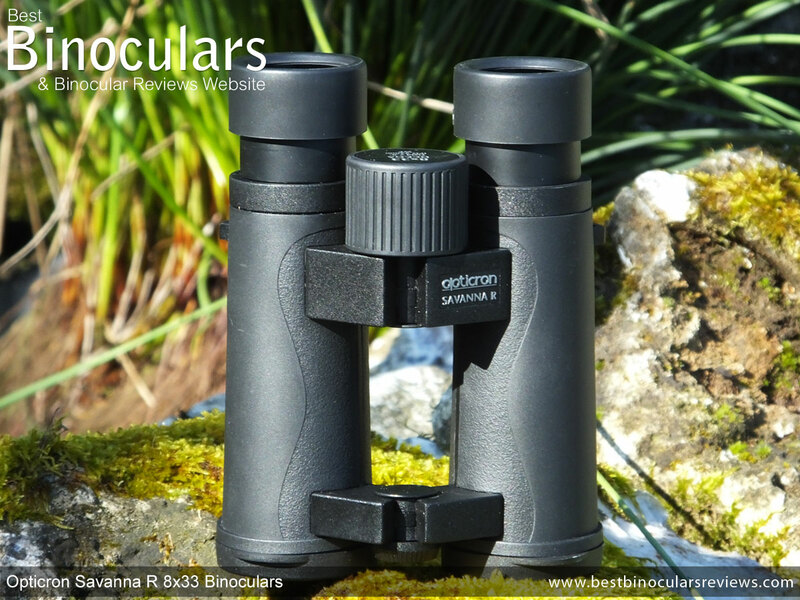 The level of fringing that I observed on the Opticron Savanna R 8x33 binoculars was what I would describe as being normal, which for a bin at this price is actually pretty good. There are some distortions that can make the image you see seem to curve in on itself or outwards as if it were placed on a ball. I never observed or became aware of these when using or testing these bins. Softening at the edges of the view is evident, more than what you observe on the best, but I would still describe it as being a normal amount and really nothing to overly stress yourself with. 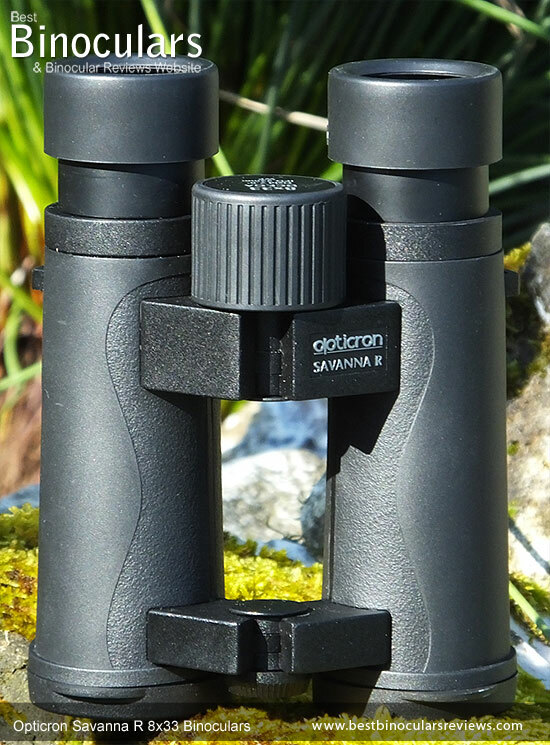 Whilst not a match for high end instruments, for a bin of this size and at this price point, I would describe the net image that you see through the Opticron Savanna R as being good to very good. The exterior material looks to be your standard woven nylon type of material, which is very strong and provides a good amount of weather protection. The amount of padding inside the case is very minimal and so you get far less impact protection than a rigid case or even those with thicker padding. On the positive side this does make for a more compact and lightweight bag that is easier to carry about, which complements the main aim of a small lightweight instrument. Access to the interior is via a simple flip over the top lid that is held closed with a strip of Velcro. This system works, but is obviously less secure than a Zip for example and the noise you make whilst opening the Velcro can startle wildlife of at least give your position away unless you are careful. For some uses like birding and hunting this can be a very important point. The binoculars fit nicely inside (not too tight to make replacing them a pain and not so loose that they just flop about), you can also easily close the lid with the eye-cups extended and the lens covers in place. A small but important detail that many others get wrong. It has it's own un-padded strap that can be adjusted for length and fixes to the case via a couple of twisting quick release clips. On the rear of the bag there is also a belt loop that gives you another option for carrying. On the inside, rear face there is a separate divider (pocket) that you can use to store a few small items and a cleaning cloth. There are no exterior pockets. 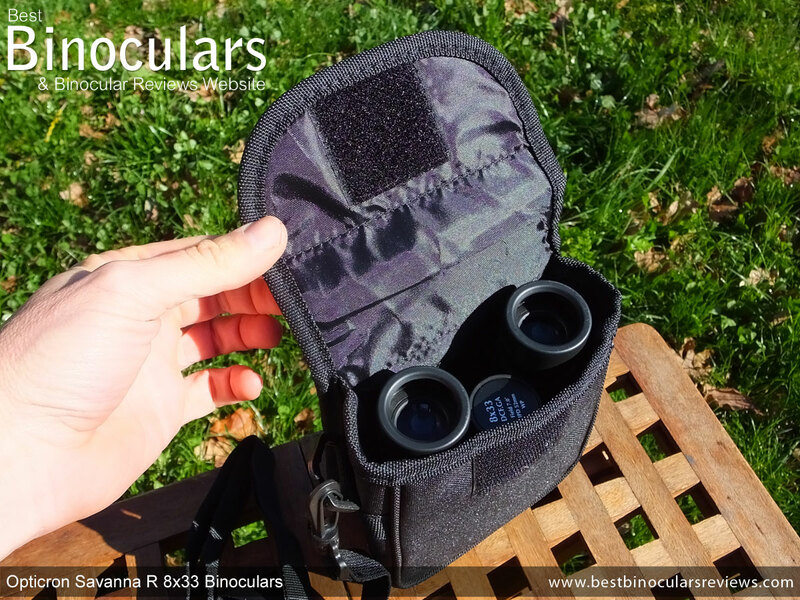 So on the whole I would describe this Opticron Savanna R carry case as being a well made functional bag that just lacks some of the finesse and finer details that you find on the best ones. In relation to others at this price point it sits comfortably amongst the best. 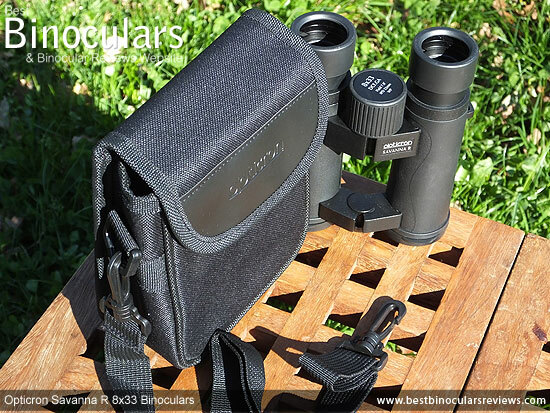 The majority of cheap binoculars come with very basic and often completely un-padded neck straps and this is even more the case with the mid-sized and compact versions. 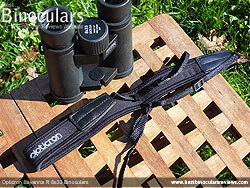 Made from what looks to me to be a Neoprene type of material the main Opticron branded neck and shoulder section has easily enough padding for this size of instrument. The thin cord sections that you thread through the loops on the sides of the binocular are made from woven nylon which is typical and can be adjusted for length in the standard way by using a couple of sliders. These cords are sewn onto the padded section via a couple of faux leather connectors that on my test sample looked to have good, secure stitching and thus should not come apart too easily. These soft rubber/plastic lens covers have a good fit over the ends of the barrels that I guess if you are being very critical is possibly a tiny fraction too loose and so could come away by accident. But to be fair to Opticron, I have seen many far worse fitting covers than these (as well as being too loose, many are way to tight and thus a pain to get back on every time) and so as long as you are mindful there really is not a major issue here. I like the fact that they have the now very common extra loop that keeps them attached to the barrel ends and which allows the main cover to swing down under the binocular whilst you look through the instrument, but are always there and easy to find and replace once you are finished. The lightweight eye-piece cover (rain-guard) looks to me to be made from the same soft rubber/plastic as the lens covers and they have a good fit over the eye-cups. The flexible bridge between the two cups works well in that it permits you to fix the covers onto your eye-pieces no matter what your IPD setting is. This may sound like a small thing, but there are some designs that require you to open up the hinge every time you want to replace the covers. Not a major issue, but it does get a little annoying over time and so it is always nice to find a well designed rain-guard that does not require you to do this! The cloth that comes with the Savanna R is a lot lower in quality than the one you get with their higher end products, but is on a par with what I would expect to find at this price level. It is for this reason that I would suggest that you only use it to clean the body and perhaps the lenses in an emergency when you are out in the field. For far better and safer cleaning with better results I highly suggest you look to get a dedicated lens cleaning kit or at least a quality microfiber cloth designed for lenses. The user instructions comes by the way of a folded card. They are typically very basic that includes brief information on how to set up your bins correctly and the care and cleaning of the instrument. The back cover of the card includes the guarantee/warranty information and registration. In the UK, these come with an impressive 10 year guarantee, whilst in North America you get the Opticron Limited Lifetime Warranty which is excellent. Strong Points: Considering their price tag, I was extremely impressed with their overall look, feel and build quality, which is far and above most at this price level and which makes these Opticron Savanna R binoculars look way more expensive than most of their direct competition. 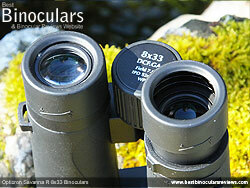 They have a good field of view and an excellent amount of eye-relief which will please eye glass wearers. You cannot argue with their limited lifetime warranty in the US and 10 year guarantee in the UK, something which is not common at this price point and which also goes to show the confidence that Opticron have in this bin. Weak points? Their minimum focusing distance is not that close and so I would not recommend these to anyone who's main interest is the close observation of butterflies, flowers etc. As with almost all instruments at this price point, the manufacturers have to make a certain amount of compromises to ensure that they come in within budget. One of the easiest and least critical areas to save money is with the accessories and so low cost bins often have far lower quality neck straps, lens covers and carry cases than even mid range products. 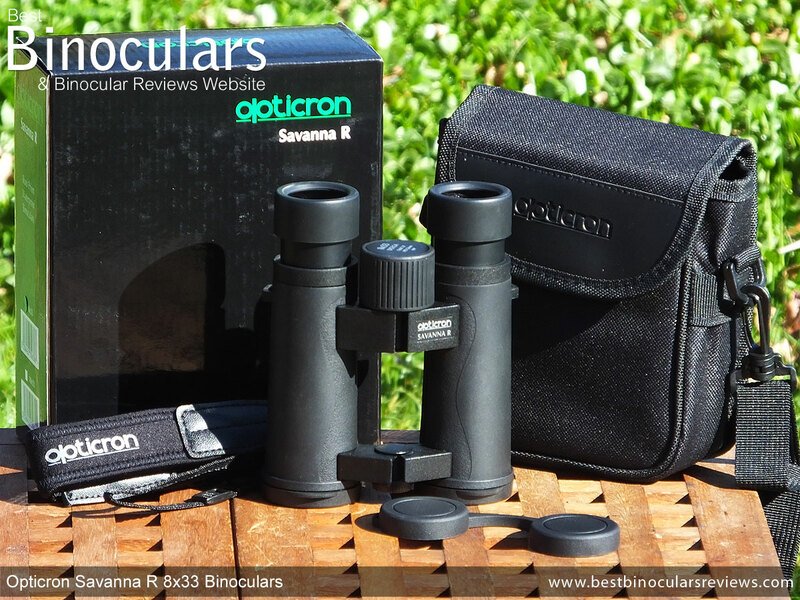 With the Savanna R, Opticron the carry case in particular is not as plush as the one you get with their higher end products, but to be fair to them it and all the other accessories function well enough and are a match to any others in this price class. 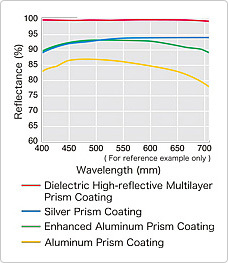 Likewise the use of Aluminium mirror coatings on the prism would certainly be considered a weakness if you were to compare them to higher end and more expensive optics. However at this price point, it is not that uncommon, but there are some that use the more reflective silver coatings. I think that it is important to also keep in mind that in my opinion, the image brightness and quality whilst understandably lacking a little compared to mid range bins, was generally good and a match for any at this level. Ideal Uses: As with all good mid-size bins, these are a great choice for travel and interests like camping, hiking and especially for taking on safaris where you want a bin that will perform and be easy to carry about. 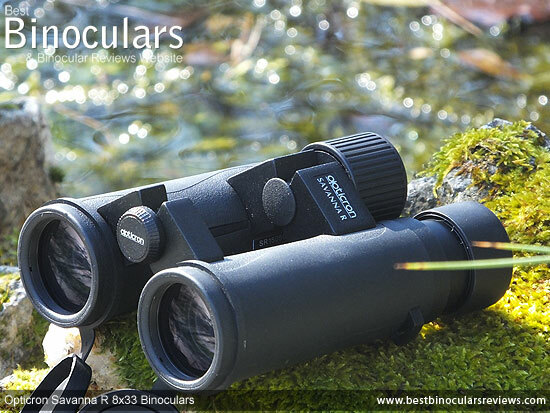 For things like birdwatching general wildlife observation and hunting, features like their more than acceptable width of view will be an asset and a great choice, especially if you are they type of user that also carries about other equipment like cameras, guide books or even a rifle. 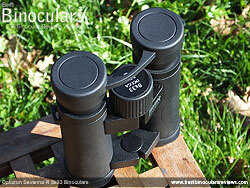 These same features also make them more a good choice for most outdoor sporting events. The close minimum IPD setting, relatively small size, low weight and open bridge design and their low cost, also make these Opticron Savanna R 8x33 binoculars an ideal binocular for a younger user who is looking for their first serious pair of binoculars. For more take a look at my guide to binoculars for children.